Want To Know More About Teaching With Hyperdocs? 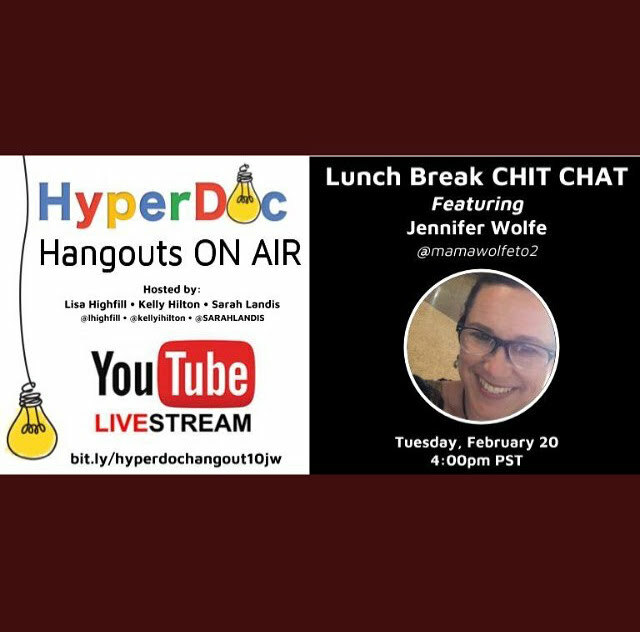 I’m so excited to be part of the Hyperdocs Hangout On Air! Today I’ll be interviewed by the HYPERDOC GIRLS – Kelly Hilton, Lisa Highfill and Sarah Landis! I’m such a hyperdoc fanatic – if you love hyperdocs, or just want to know what they are or start creating hyperdocs for your classroom, join us LIVE at 4:00 on Tuesday, Feb. 20, 2018! Can’t make it live? No worries – you can find the recorded hangout at this link: www.bit.ly/hyperdochangout10jw . You can watch it over and over again! We’ll be chatting about all things HYPERDOCS – including challenges, my ‘aha’ moment, how to get started, inspiration and how hyperdocs have transformed my teaching. Are you wondering what all the hype is around hyperdocs? You SHOULD be! Hyperdocs have absolutely transformed both my teaching and students’ learning. The organization, creativity and collaboration in my classroom is higher than ever before! I’d love to share some of my favorite hyperdocs with you – just use these links to make a copy and add them to your teaching tool kit! Are you looking for a specific type of hyperdoc? Would you like help? Do you want to COLLABORATE? Have you used one of my hyperdocs and made it BETTER? I’d love to hear from you! Please comment, tweet, or Facebook me – and please join us or watch the recorded hangout! @mamawolfeto2 Hi! Looking at your college research hyperdoc. Can you share your slide deck template guidelines? Wondering what those looked like. Hi! I just replied by email – the link should allow you to view now. Awesome! Got it and thanks! We do college research and the kids create their own college pennant. I think a shared slide presentation will be a perfect little addition. Thanks again. Courtney, how did the project go? I’d love to see your results! Tara, You’re very welcome! Are you adding hyperdocs to your classroom? It will change your LIFE!